California is currently experiencing one of its wettest winters on record. Precipitation has been especially remarkable across the Northern Sierra watersheds, where liquid equivalent (rain+melted snow) is presently above 200% of average. Widespread flooding has already occurred across Northern California in recent weeks, and supersaturated soils are now leading to slope failures (mudslides and landslides) across much of the state. In additional to the “typical” flooding of regional rivers and streams that one might expect with prolonged heavy precipitation, California’s vast water storage and conveyance infrastructure is starting to crack under the strain–in some cases, quite literally. Late last week, the ongoing situation at the Oroville Dam in Butte County escalated dramatically when water overtopping the “emergency spillway” started to cause major erosion on the steep hillslope directly beneath the structure. Emergency evacuation orders were issued on very short notice to hundreds of thousands of people living across a swath of the eastern Sacramento Valley from Oroville to Marysville and Yuba City due to fears that the top 30 feet of the structure might imminently collapse, causing destructive flash flooding for many miles downstream. Fortunately, it appears that potential catastrophe has been averted for the time being–dam operators were able to increase flows down the damaged primary spillway and reduce water levels sufficiently to stop overflow and halt erosion. Since that time, a frenzied repair effort has been underway to shore up the emergency spillway and minimize further erosion if it comes into use again. A major challenge remains, however: dam operations cannot release water at as high a rate as they would under normal circumstances, meaning that the Oroville Dam may once again fill to the brim if storm or snowmelt-related inflows become high enough at some point over the next few months. Additionally, serious issues have started to arise in the vast levee system that protects much of the Central Valley and Delta region from flooding. So far, there have not been any major levee failures in California this winter. But if the current forecast holds, the levee system will be under more strain by early next week than it has been in many years–and certainly since the locally dramatic ground subsidence which has occurred as a result of groundwater losses during the multi-year California drought. A powerful atmospheric river, with a moisture tap extending all the way back to Hawaii, will make landfall in Southern California on Friday. This storm will be squarely aimed at the transverse ranges of Southern California, and it is very likely that the higher elevations of Santa Barbara and Ventura counties will see extremely heavy precipitation on the order of 10+ inches on Friday/Saturday. A modest surface low is expected to develop just off the California coast on Friday, further strengthening the cold front and generating the potential for strong, locally damaging winds across all of Southern California. The combination of copious moisture and strong dynamics will mean that even areas away from the mountains will see heavy–perhaps very heavy–rainfall. Los Angeles County, in fact, could potentially see one of its wettest 24 hour periods on record (even downtown LA could exceed 4 inches, with much more in the foothills). The NWS points out this storm will likely be the strongest of the season in these regions, and perhaps in the past 10-20 years in some of the wettest spots. There are still some significant inter-model differences regarding precipitation totals–the ECMWF is not as wet as the GFS, and some of the high-resolution models stall the front west of Los Angeles. But confidence is pretty high at the moment that very heavy rain and strong winds are likely across SoCal on Friday, especially from Los Angeles northward. Widespread urban flooding is likely, and potentially dangerous flash flooding will occur in/near the Transverse Ranges and near recent wildfire burn scars. Impacts will be amplified by storm timing–the peak rainfall is expected between 3-6 PM in Los Angeles, which should make for a nightmarish commute. A few thunderstorms are also possible along and behind the front, some of which could bring some strong winds down to the surface along with brief torrential rainfall. 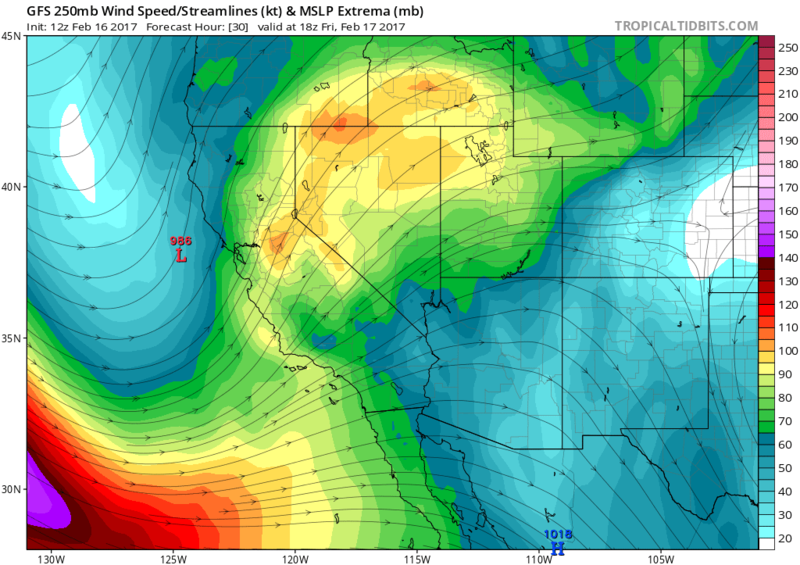 All in all, I do expect this will be a very high impact storm across much of California. Unfortunately, the forecast for the Feather River watershed upstream of the Oroville Dam has become somewhat more ominous over the past 24 hours. 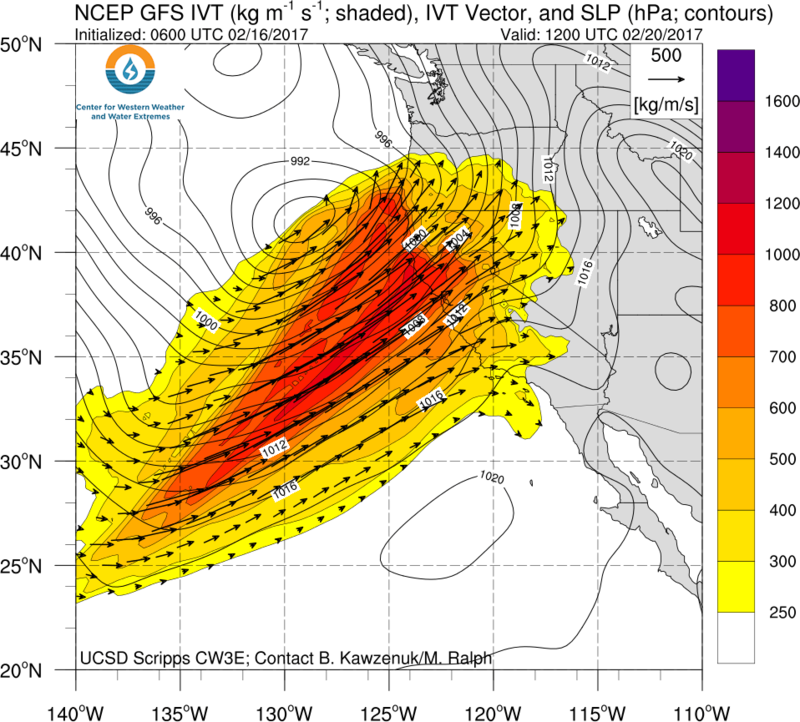 Instead of a series of moderate, cold, and relatively manageable storms as had originally been depicted by the models, a rather strong atmospheric river is now expected to develop and slowly move across Northern California on Monday. The GFS and ECMWF agree that this storm will tap into subtropical moisture, bringing a warm and moist airmass into the region. Mountain peaks in the vicinity of Oroville Dam are not as tall as those further south along the Sierra Nevada mountain chain, so it’s easier for warm storms to produce exclusively rain (as opposed to snow) in that part of the state. The Monday storm may indeed be warm enough for most/all of the precipitation in that watershed to fall as heavy rain, which is not good news for current mitigation operations at Oroville Dam. Recent forecasts show a high likelihood of greater than 10 inches of precipitation over the next 5 days, with parts of the basin expected to approach 15 inches over the next 7 days. It is unclear at this point exactly what impacts this expected heavy rainfall will have on dam operations, but it’s clear this is not the forecast that DWR officials and emergency managers were hoping for. The warm/wet storm on Monday will likely cause problems elsewhere, as well. Rivers and streams all across NorCal will likely rise rapidly, and many will flood. Additional mudslides are likely; widespread and potentially prolonged road closures are possible. We have also now reached the point where levees along mainstem rivers in the Delta and Central Valley may start to experience more serious problems–something that will have to be watched carefully in the coming days. 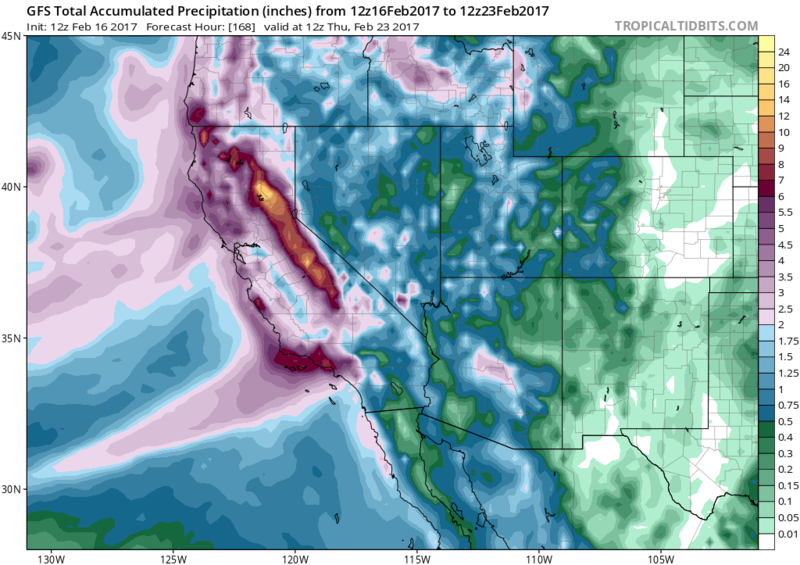 As recently as yesterday, it appeared that Northern California might get another break from the rain during the last week of the month. Today’s model forecasts, however, show no such rest for the weary. So at the moment, it it unclear how long the current active storm pattern will persist. I’ll continue to post real-time storm and Oroville Dam-related updates on Twitter. 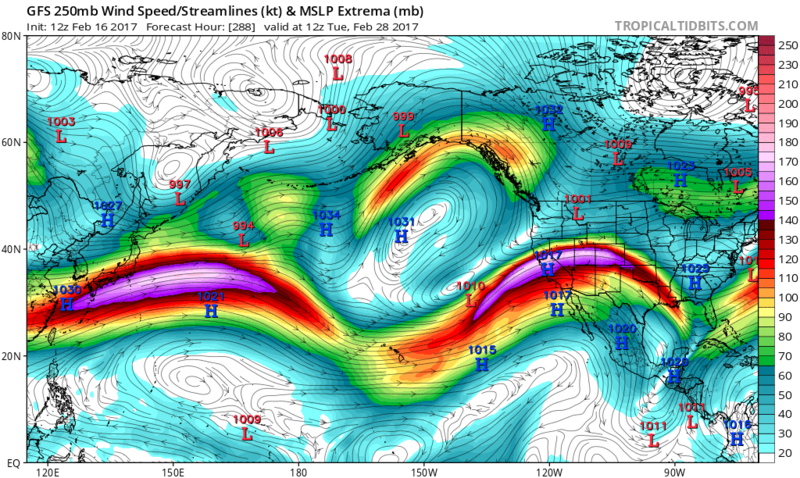 « Another storm for rain-weary California this week, then a break, then…yet more storms to come.